Every piece of cardio equipment in the gym has a different use and a different benefit. For some people, the treadmill will work optimally. For others, an elliptical. Understanding these pieces of equipment is necessary to obtain all the benefits you are looking for. Below, I will explain more about how to pick the right piece of cardio equipment for yourself! In my opinion, no one should ever run on a treadmill. Studies have shown that running on a treadmill can be very difficult for your joints, no matter how in shape you are. In fact, high-level athletes can even damage their body worse than untrained athletes running on a treadmill! However, walking on a high incline on a treadmill is an excellent way to burn off some calories at the beginning or end of your workout. Especially for people who are just beginning to learn how to train, or are completely out of shape, walking on a treadmill is great for building a small amount of aerobic capacity. 10-15 minutes of incline treadmill walking is a perfect way to use the treadmill in your workout! The stationary bicycle is excellent for being used as a warm-up on leg day and performing High-Intensity Interval Training. Stationary bicycles can be used more intensely than the treadmill, in my opinion, because it is much safer than the treadmill. One of the most recognized interval training routines in the world is the Tabata method, which was originally tested on the stationary bicycle. 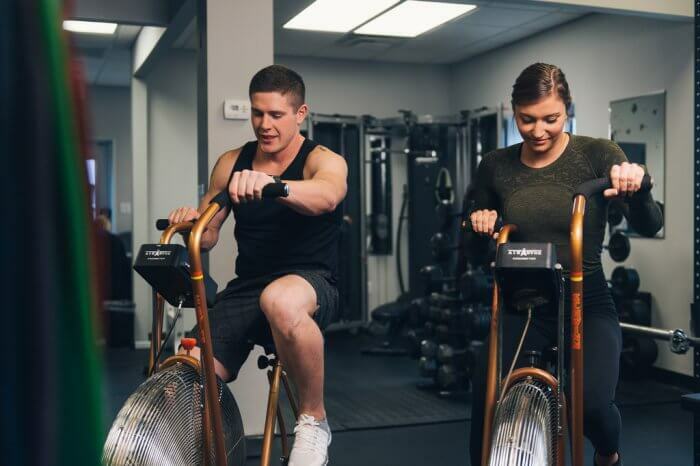 You can perform interval training on a stationary bicycle at the end of any of your workouts, to burn a substantial number of calories quickly. Along with this, doing interval training on a stationary bicycle can also help to strengthen your legs. Professional cyclers have massive and strong legs, which you can also achieve by using a stationary bicycle. The Jacob’s Ladder is not often picked by many people as their cardio machine of choice, but that is probably because it is difficult! One awesome benefit of the Jacob’s Ladder exercise is that it is extremely beneficial for training your muscles and anaerobic threshold, but minimal impact on your joints. The best way to use Jacob’s Ladder is to add 3-5 sets of 100-200 feet, after your workout. The Jacob’s Ladder is a perfect “finisher” to your daily workout, and will help you burn fat off of your body quicker than you could ever expect! You can easily burn over 20 calories per minute with this exercise, but you will be very tired, to say the least! You can get benefits from just about any piece of equipment in the gym, but it all depends on how you use it. Choosing the correct piece of cardio equipment, and the correct workout to associate with it, will determine your overall benefits. PrevWhy Investing in Cryptocurrency Can Be More Profitable Long Term? Next7 Best Beaches in the South India That Will Truly Amaze You!